Specifications· Wire Type: Female to Male· &n..
LEDs - A must have for power indication, pin status, opto-electronic sensors, and fun blinky displ.. This motor mount bracket is designed for Side Shaft and Center Shaft, ..
TM1637 is a chip for driving 7-segment displays. There are several modules using this chip to form.. This Spur Gear made up of Plastic is tough and has good pressure ratings. The spur can be used along..
A float sensor is a device used to detect the level of liquid within a tank. The switch may be use.. 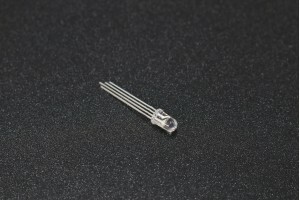 This is a full-color SMD LED module. The module has on-board current limiting resistors to prev.. The Atmega16 Microcontroller is high-performance; low-power Atmel 8-bit AVR RISC-based microcontro.. This is the basic L7809 voltage regulator, a three-terminal positive regulator with a 9V fix..